Mobile apps are wonderful things, aren’t they? Most of them are free, and all they cost you is a little space on your smartphone or tablet. Well, that’s not exactly true. There are thousands, if not tens of thousands, of apps that are designed to get you to spend your time on them. And most of them are not exactly what you might call productive uses for your time. There are more games on mobile devices than were ever available on regular video game consoles, from Angry Birds to Plants vs. Zombies. But that is okay because we have to take the bad with the good. Right now we are going to talk about a certain type of app that is designed not to spend your time, but to save it. We are, of course, referring to the inventory management app. Apps have been around since as far back as 1983, but it was the invention of the iPhone in 2007 (can you believe it has been more than a decade since that was first launched?) that really made apps come into their own. While touchscreens had been tried before on other devices, the iPhone was the first bit of hardware to catch on and really popularize the technology on a massive scale never before seen and never even thought possible. Touchscreens are tailor-made to mobile apps. They allow you to get around the clunkiness of a mouse and keyboard that were (and still are) intrinsic aspects of most desktop computers. Suddenly, you could just tap your finger on a screen to manipulate items and drag them around. That is exactly what makes apps so intuitive and easy to use. People of all ages can quickly learn how to use an app. And this brings us to the present day with the advent of inventory management apps. Flexibility – A good inventory management app allows you to use all sorts of tools to add, remove, transfer, order, and cycle count the inventory you have on your shelves in the warehouse. It lets you instantly access important data on quantities, sales orders, purchase orders, and other things that make your job easier. We will delve even deeper into the flexibility that this gives you in the next four points, but let’s just say for now that you can make much better use of your time and increase the accuracy of your inventory data with the aid of this invaluable tool. Security – An important factor when managing inventory is the security and safety of your data. Do you know who is making changes to your files and who is authorized to do so? You can’t do that with Excel spreadsheets or with paper notes. But an app with an audit trail and user logins can do just that so you will be able to make sure only certain people have access, and you can tell when they make changes and what those changes are. Touch and Go – You do not have to stay at a desktop computer to get in-depth inventory management features when you have access to an app that has many of the same features that you will find in desktop solutions. You can open pick tickets and cycle counts on a mobile device and check off items as you go through the warehouse. This frees up you and your staff to literally touch and go as you walk through aisles and update your inventory records as needed. Staying Up to Date – The great thing about an inventory management app is that it can instantly update your records to reflect newly received items, recently placed purchase orders, incoming sales orders, and much more. You do not have to worry about things falling through the cracks. When a change is added to the system, you will be able to see it fast. Plus, if you have an account with other online business solutions, such as Stripe for payment processing or QuickBooks Online for accounting, you can integrate them with the inventory management app to make sure data flows smoothly between them and gets recorded accurately in each one. Scan in and Out – You can use barcode technology to scan parts’ and products’ barcodes in order to access detailed information about them, such as their locations in the warehouse, quantities, vendors, etc. When you need to pick items for a sales order, you can do so with the scan of a barcode to make sure you get the right ones in the right quantities. And you can also scan items that are coming into your warehouse to make sure the vendor got everything right. Boxstorm offers both an iOS and an Android inventory management app. 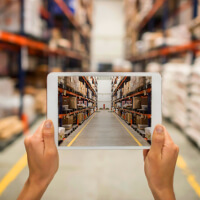 These apps do everything mentioned above, and they connect to an online inventory solution that enables you to do even more. Sign up for a free account with Boxstorm Forever Free and then download the free apps to see how they can really take your business to new heights!